The 5th of November. Bonfire night. Guy Fawkes. And so, with the apt smell of damp gunpowder in the air, we headed down to my friends James’ parents house and met up with the usual suspects, their partners and additional family members for a good show. Earlier this week V for Vendetta had put me very much in the mood for the holiday. It is an unusual take on the whole Gunpowder Plot and how it inspires the citizens of a police-state London run by a dictator to stand up and take their country back. Whilst I don’t agree with violence to achieve political change it was a not too subtle reminder about keeping our governments in control and making sure they remember who serves who. The fireworks were self-organized being the explosive equivalent of bring a bottle and so I handed over my obligatory couple of packets of fist sized rockets I’d managed to purchase just as Oatlands ran out. I think the guy behind me got the last two packets – and that’s only because I decided not to take four and deprive him of any. The display went mostly without a hitch although the lack of wind dropped the odd spent rocket fuselage back down to the ignition team and one firework return to the ground before exploding. Luckily nobody was injured – most had the sense to run away and the team was spared for next year. Notably absent from this years lineup of fire-starters was Jamie who is away practicing being smug at university in England. We ate hot-dogs and the Guernsey specialty, bean-jar, consuming them and drinks in the marquee (except the designated driving few – alas myself included). We chilled out and so wombled over to the bonfire and warmed back up all the while chatting and enjoying the dancing lights in the sky. As a plane came in low heading towards the airport I made a mental note never to fly on November 5th. Alas things took an ugly turn as the police arrived. James’ uncle’s new Land Rover was parked out by the seafront and had been intentionally vandalized. Specifically the front two tires had been let down and the bonnet (hood) had been badly scratched up – perhaps with something sharp like a screwdriver. About 20 minutes later we were informed by an officer that a neighbor had been arrested and was being taken to the station – presumably on criminal damage charges. And thus ends the story of our 5th of November. Take care! A few weeks ago I got a cut, mysteriously, on my left middle finger right on the outer knuckle joint. In fact on the very spot of an old scar – I forget which of my many little incidents caused that one but it probably involved a BMX and my childhood thirst to perform tricks beyond my ability. Anyway, this cut bubbled up into a nasty looking thing. A tower of bubble, bubble within a bubble. It looked a bit like a wart but softer, sensitive and with a propensity to start bleeding from the slightest knock as my friends found out a few weeks ago when I ended up spraying an interesting red pattern across my favorite white shirt downstairs at a local bar. Like most guys I left it for a week, two, three maybe (the finger, not the shirt) before finally admitting there was a problem that wasn’t going to magically disappear and headed to the doctor. It was diagnosed as something long, Latin and specifically chosen so that us mere mortals would not remember it’s name let alone how to spell it to put on our blogs. Today I got to sit in a chair whist my finger was numbed, the blood flow restricted then the bubble cut off (to be sent away for analysis no less). That was fine, apart from the moment my curiosity got the better of me and I looked down and glimpsed all the blood. As previously alluded to I’ve seen my blood more than enough times so that didn’t bother me too much. What was strange is I suddenly got very hot and was regretting wearing clothes. Despite my mental reassurances that all was fine and that I was in safe hands my stomach threw a wave of nausea over me and my eyesight blurred. Thankfully the doctor noticed I was looking a bit faint, well green he said, and the nurse made me feel more comfortable before I do something awkward like fall off the bed and crack my head open. The next stage was the scraping and scooping out of the inside of my finger. I couldn’t feel it directly but I could feel the scraping movement reverberating through my fingers, my bone, my hand. Once done the skin was cauterized, i.e. burnt and the smell of burning flesh reached my nose shortly before the nurse cleaned it up and bandaged it. So here I am, bashing at my Model M as best I can with my remaining functional digits. Back to work tomorrow alas, the deadline looming. The keyboard there shall feel my nine finger grip of death. 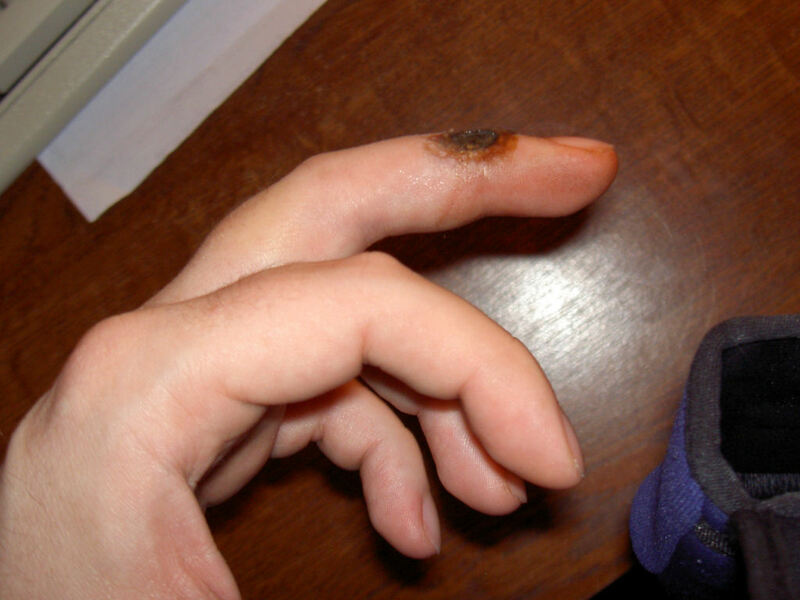 Yukky picture alert – my burnt finger for those that asked.